Writing The Color of Truth was truly a labor of love. I have often felt as Marti does - I don't fit in, I'm not smart/funny/pretty enough. And I know most people experience this at one time or another. Writing Marti's story helped remind me (and I hope my readers) that the God who created us knows us intimately and loves us unconditionally. We don't have to try to measure up because He is all that really matters. 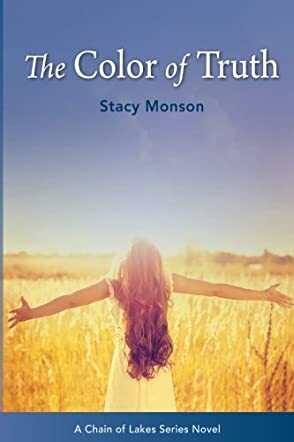 The Color of Truth (The Chain of Lakes Book 3) by Stacy Monson is a heartwarming story about Marti, a young adult who has had an extraordinarily bad life. Having a father in jail and a drunk for a mother, Marti has felt anything but loved. Her sister, Katie, who is still a minor and has been placed in foster care, is developmentally challenged and Marti carries that burden on her shoulders as well. Unknowingly, Marti allowed a very bad man (a drug dealer) to come into her life. A decision that will put her and her sister in danger. And then there’s Sam, who has suffered much himself. After a tragic event at the youth center and his pregnant wife walking out on him, Sam struggles with his own issues of guilt and self-worth. The Color of Truth is a truly encouraging story of God’s love and grace. Stacy Monson has created beautiful characters that speak to the heart. I couldn’t help but love and feel for Marti and Sam. I enjoyed the way God worked in Marti’s life to give her the self-confidence she needed to realize just how capable she was. I felt a strong connection to Marti. Her lack of self-worth and feelings of inadequacy touched me on a whole new level. This is the third book in The Chain of Lake series and, although I haven’t read the first two, I had no problem following the story. The Color of Truth is easily a stand-alone book. I look forward to reading the first two in the series. Applause to Stacy Monson for creating a beautiful story. Stacy Monson pens an inspiring love story in The Color of Truth. Beaten to within an inch of her life, Marti Gustafson hangs her head in shame. Officer Ben Evans steadies himself at her hospital bedside, attempting to take her statement. Marti refuses to name her attacker. Meanwhile, Sam Evans works at his cousin’s woodworking business. It feels good to work with his hands. Jimmy’s shop was a perfect place for Sam to hide and wallow in self pity. He’d lost everything - his marriage, career and reputation. After being released from hospital, Marti loses her job, and is kicked out of her apartment. This is not the first time Marti has been homeless. Life seems to repeat itself. Bad decisions create more bad decisions. Jason, the owner of her favorite coffee shop, finds her sleeping in the alley, and gives her a job and a place to stay; maybe God really does answer prayers. Marti's and Sam’s lost and lonely lives intersect at The Java Depot. Sam wants to know more about the woman with bruises, doe eyes, and who says she has heard from God. Yet, Marti wonders if she can really ever trust in anyone again. The Color of Truth by Stacy Monson is a story of love and devotion. The narrative reveals how genuine love grows; it portrays the true definition of love. Love is patient, kind, and not self-serving. Nor is it proud or envious of others. Love searches for truth, even when it is hard to accept. Love “always looks for the best, never looks back, but keeps going to the end” (MSG). The characterization is magnificent! The characters of Marti and Sam intricately draw you in, you can’t help but love them and be caught up in their unfolding story. Monson creates unexpected “oh my, what’s next?” moments and surprising encounters, making the narrative hard to put down. Just when things begin to look up, the villain returns, causing the plot to thicken and the action to lurch forward. Yet, all the while, God’s voice gently whispers, and delicately guides. Monson takes her characters to the brink of despair, challenges them to pursue happiness, to conquer fear and doubt, and satisfies their soul with justice and peace. Thus proving, God’s love never gives up or runs out. The Color of Truth by Stacy Monson is a sweet romance story that isn’t all about the romance. Marti and Sam both face terrible challenges in their lives. Sam has had the rug pulled out from under him when he lost everything, including his wife and his job. Marti never stood a chance of having a decent life, or so she thought. The two meet and, together, they overcome their individual challenges, but not without the help of God who is a definite force present throughout the book. The Color of Truth is definitely very heavy on Christian overtones and is not for the reader who would rather have a subtle approach to Christian fiction. That said, it’s a very touching story with lessons that can be learned by all of us. Sam’s story reaches out to those who have walked with God and, for some reason, may have had their lives turned upside down and became discouraged. Through Sam, Stacy Monson teaches us that God is always present, even when we aren’t on speaking terms with Him, and it is possible to continue a relationship with Him that may have seemed to be completely lost. Marti, on the other hand, has been taught her whole life that she was “stupid” and “worthless.” The Color of Truth teaches her the truth about herself; that she is loved, beautiful and valuable. This book is an easy read and I would recommend it for those who need to be reminded of God’s love in a less preachy way. Also, this would be an excellent read for young women interested in the romance genre, but who would rather steer clear of racier books.